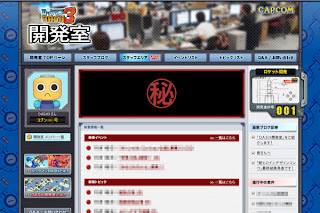 Ever since Legends 3 was announced, Capcom's been hyping up the "devroom" -- a specialty site where fans and Legends 3 dev members can meet up to work on the game together, in a sense. Capcom's been mostly quiet on just how this whole devroom experience will work exactly, but tonight the curtain raises just a bit. Over at the work-in-progress devroom, MML3 direct Mazakazu Eguchi introduced a new staff member, Kinako Ikawa (pictured). Kinako is but one of many MML3 web planners who will soon be updating the devroom periodically. However, in the meantime, Kinako herself had a few words to share tonight in regards to the final devroom, offering up some new details and even a sneak peek at the site's layout and design. Hit the jump for the lowdown! "As a member of the Legends 3 team, I am glad to be able to greet all of you like this. 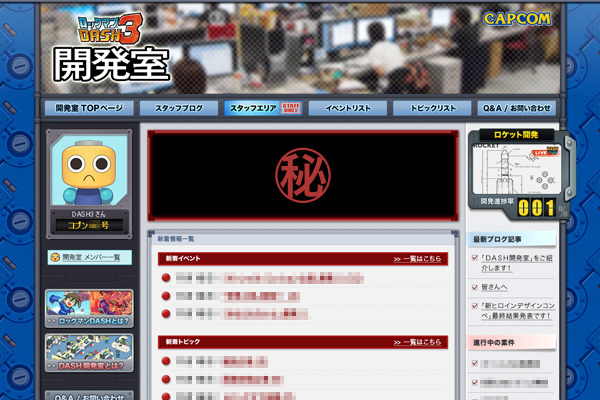 I’m looking forward to working with you on Mega Man Legends 3 and having a great time! Alright, now for the moment you’ve been waiting for. Allow me to tell you about our video game development social network, the Mega Man Legends Devroom! The Devroom will be opening soon in both Japan and North America. We’ll post the exact date of the grand opening first here on this blog, so please check back often. We’re not quite ready to show you what it looks like inside yet...But... oh well, I’ll just give you a quick peek. Tadaaa! This is how it’s shaping up! You’re probably wondering what a lot of this stuff is... The rocket you see over there on the right... Could that be the one they’re planning to use to rescue Mega Man? When you visit the Devroom for the first time...The first thing you’ll see is...! The second big event following the “New Heroine Design Contest”, which we’re calling... Oh my...! ...Oh shoot! I almost spilled the beans on some super top-secret information. We’ll give you more information when you get inside the Devroom! ...Ohh, I want to tell you so bad! But, I can’t...! All I can tell you is that it is very exciting...! Also, for those who sign up to be Devroom members will be assigned their very own Servbot Number. But that’s not all! For people who get in on the action We’ll give away a special assortment of goodies like limited-edition wallpapers! In TOPICS, come together and exchange ideas, opinions, and even upload pictures. This social network will let you experience, up close, the fun of game development! As we announced before, to coincide with the grand opening of the Devroom, we will reveal the final designs for our brand new heroine. And we’ll introduce you to even more members of our dev team! Honestly I can hardly sit still while I’m writing this. ...I think I’ll ask Eguchi Director if I can tell you about our next Devroom event just a little bit early." Well, this certainly sounds interesting. Can't wait! Agreed. I been to a paticulair site and it was a troll site... -_-! This is such a cool idea. So pumped. I don't really like this Idea... I mean it's okay to include Fans in some stuff, like with the Heroine thing, but this devroom thing... I'm scared it could end like a flame/troll site.